Interior Routing Protocols: These protocols are used to exchange routing information between routers within an autonomous system. Interior routing protocols are not used between ASes. Exterior Routing Protocols: These protocols are used to exchange routing information between autonomous systems. They may in some cases be used between routers within an AS, but primarily deal with exchanging information between autonomous systems. Key Concept: Interior routing protocols are used to share routing information within an autonomous system; each AS may use a different interior routing protocol because the system is, as the name says, autonomous. 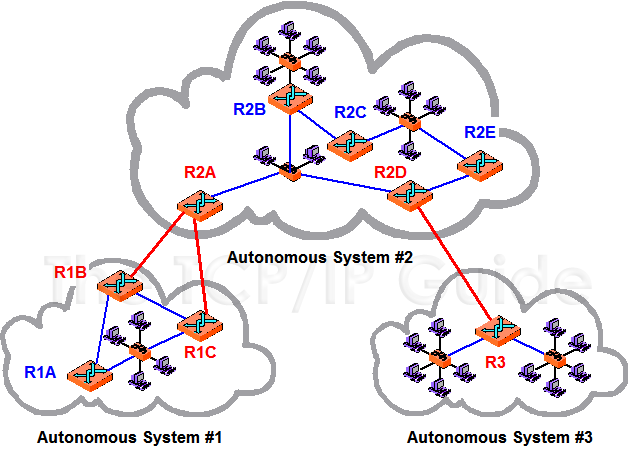 Exterior routing protocols convey routing data between autonomous systems; each AS must use the same exterior protocol to ensure that they can communicate. Internal Routers: Some routers in an AS connect only to other routers in the same AS. These run interior routing protocols. Border Routers: Some routers in an AS connect both to routers within the AS and to routers in one or more other ASes. These devices are responsible for passing traffic between the AS and the rest of the internetwork. They run both interior and exterior routing protocols. Due to its advantages, the autonomous system architecture, an example of which can be seen in Figure 171, has become the standard for TCP/IP networks, most notably the Internet. The division of routing protocols into the interior and exterior classifications has thus also become standard, and all modern TCP/IP routing protocols are first subdivided by type in this manner. You can see this reflected in the subsection titles in the rest of this section on routing protocols. This diagram shows a simplified internet organized into three autonomous systems (ASes), each of which is managed independently of the others. Communication within each AS is done using an interior routing protocol chosen by that ASs administrators (blue links); communication between ASes must be done using a common exterior routing protocol (red links). Internal routers are shown in blue and border routers in red.